Home / Dog Dream / Do Dogs Dream? A sleeping dog snores and appears to dream. They yelp, bark, make strange noises and move around. Sometimes the noises sound quite distressing and can make you feel quite sorry for the animal. We may not be able to ask our dogs if they dream but all of the scientific data points to the fact that yes, indeed, dogs do dream. According to researchers, dogs have the same kind of sleep patterns that humans have. That is, they have SWS, or Slow Wave Sleep, the first stage of sleep. This is light sleep in which the dog is easily awakened. Your dog's breathing is slow and regular but he's ready to spring into action if needed. The other stage of sleep with which most people are familiar, and which dogs share, is REM sleep. This is when you see your dog twitching or moving his paws. He may bark, whine or growl in his sleep. Dogs and humans have similar EEG readings at this point and we know that humans dream during this REM stage, so it makes sense to extrapolate that dogs are dreaming as well. When your dog is in this deep, relaxed state of sleep and, presumably dreaming, it can be very hard to wake him. You may need to shake him several times to rouse him. Do be careful when you wake a dog from this deep sleep since he may be slightly confused at first. 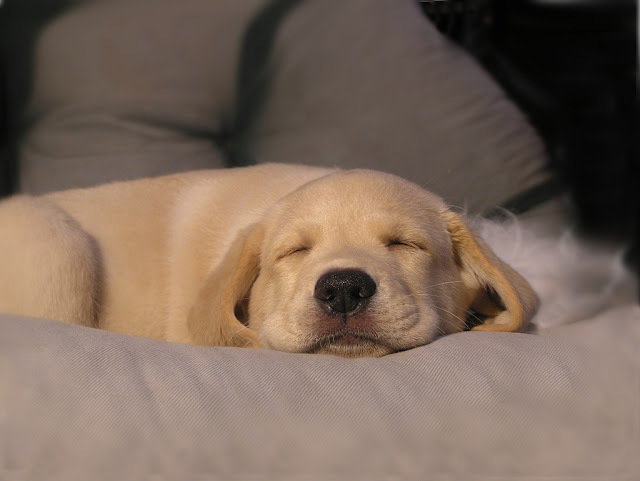 Emphasizing the similarity to humans, dogs can also have sleep disorders such as narcolepsy. Sleep apnea is the most common sleep disorder in dogs. It is more common in overweight and brachycephalic dogs. Puppies are believed to dream more than adult dogs. Perhaps this is because they spend a large majority of their first few weeks sleeping. However, they do need to process an enormous amount of new information each day as they learn about life. Puppies are learning how to use their muscles, how to think, how to relate to other puppies and dogs (social interaction), how to function with people (human bonding). The list is endless. They are growing at a tremendous rate in their first weeks. It's no wonder that they spend a lot of time sleeping and dreaming so they can try to organize what they're learning. Dreaming does seem to help people process information so it may also serve this function for dogs. Does your dog have nightmares? Possibly, dogs often seem to growl or become defensive in their dreams. Does your dog have happy dreams? It seems likely. Many people joke that a dog is chasing a rabbit in their dreams but this may be true. Maybe your dog dreams about spending a great day with you, playing games and eating treats and getting ear scratches. The truth is that we just don't know what a dog dreams about. It could be anything. But it seems undeniably true that dogs do dream based on the scientific evidence. Maybe someday we'll be able to find a way to translate brainwaves directly into visual images so we can see what our dogs are dreaming. Or, maybe we could ask an animal communicator. But right now no one knows what dogs dream.